Is it possible for one to agree with both Hal and Lee and the folks that believe that the monetary stimulus helped? Look at the graph on Glasner's page. It shows that an upward trend began in industrial production immediately following FDR's devaluing of the dollar. However, if you look closely at that graph, you also notice that the upward trend in industrial production gets relatively flat during the NIRA period before rising again. These stories don't need to be mutually exclusive. It is possible that monetary stimulus was successful, but that the cartelization policy had an adverse effect on the labor market and stifled growth. I'm not saying that one should accept the view that I am putting forth, but rather that I don't see how the two explanations MUST be mutually exclusive. I would also like a response to Glasner/Sumner. Krugman's behavior is not really news. Cole and Ohanian say that 'The main point of our op-ed, as well as our earlier work, is that most of the increase in per-capita output that occurred after 1933 was due to higher productivity – not higher labor input.' But according to the actual text of their op-ed 'the key point is that higher aggregate demand didn't significantly expand the amount of work that was done'. Further, as Brad Delong points out, Cole and Ohanian do not mention this 'main point' in the first three paragraphs of their op-ed, but focus on the argument that the level of production is unrelated to aggregate demand. It seems to me as their 'clarification' is an evasive maneuver rather than an attempt to tackle the criticism of their op-ed (by Sumner, Delong, O'Rourke, Glasner and maybe others I haven't noticed) head on. Well, "aggregate demand" (whatever that is) can only affect output through labor -- the capital stock is fixed and productivity is beyond the control of the government. Ergo, if labor didn't rise, aggregate demand didn't raise output. ^ This makes no sense to me: aggregate demand simply means there is increased demand for the goods that firms produce. To meet this extra demand, firms can hire more workers, purchase more capital, work their available capital more, or invest in new productive technologies which increase their output per unit of input. Which one firms actually do will depend on the relative costs and benefits of each. So this idea that a change in "aggregate demand" would necessarily require a change in labor input makes no sense to me. Doesn't this just pin point a key criticism of the RBC model. If there are frictions in hiring and firing workers, then increases in aggregate demand will show up as increases in productivity. I guess if some workers are producing organizational capital, you don't even need frictions to have aggregate demand increasing measured productivity. These graphs are pretty striking. Cole and Ohanian don't think leaving the gold standard had any effect? "The demand for goods is not the demand for labor." -- an insight well known to economists prior to Keynes. "this idea that a change in "aggregate demand" would necessarily require a change in labor input makes no sense to me." It made no sense to Hayek, either, who attacked the explanatory machinery of Keynesian economics on just this point. "Doesn't this just pin point a key criticism of the RBC model. If there are frictions in hiring and firing workers, then increases in aggregate demand will show up as increases in productivity. " No, they won't. The capital stock is fixed today, so if you don't hire any more workers you don't get any more output. Increases in demand will show up as a higher relative price of output today (real interest rate). Don't you people understand basic economics? The only way AD increases translate into output increases is through effects on the labor factor, e.g. employment/aggregate labor hours. It may not make sense to you and you're welcome to disagree with it, but it's just flatly true of the world as depicted by Keynesian models (New, Old, whatever). You should be directing your criticism to the Keynesians that came up with the models, not Cole and Ohanian. It makes sense as well, really. If a firm could increase productivity without a change in labor/capital inputs well... they'd be doing it already. The capital factor is basically an empirical non-starter most of the time. That leaves the labor factor. What kinds of productivity enhancing changes do you think firms are making that could plausibly be a response to an increase in AD?
" If a firm could increase productivity without a change in labor/capital inputs well... they'd be doing it already. " But not if they thought the capital investment would not be worth it. Massive pre-1933 deflation meant that investments were likely to be a loss, and that saving your dollars was a better investment as they grew in value. Since when did Keynesian economics exclude the possibility of changes in capital utilization? Paul Krugman claims our economic history is in "incredibly bad faith"
Please do not lead with statements like this, the tears of laughter make it very hard to continue. The comments in this thread are quite incredible. Therre is nothing in Keynesian economics that requires that changes in aggregate demand translate into changes in labor input, after all capital utilization is variable. Anyone who ignores that is either poorly trained or willfully ignorant. That labour hoarding induces procyclical movements in measured productivity certainly isn't news to anyone who has lived through a few recessions and taken the trouble to read newspapers like the FT and The Economist. Actually, the WSJ was also a good newspaper at one time. But it publishes awful rubbish now. if "There is nothing in Keynesian economics that requires that changes in aggregate demand translate into changes in labor input, after all capital utilization is variable", what is the relevance of Keynesian macrcoeconomics to counter-cyclical policy and recessions, and depressions. what is the point? "relevance of Keynesian macrcoeconomics to counter-cyclical policy and recessions, and depressions. what is the point?" Generally increases in aggregate demand increase labor input. Obviously Hayek could come up with some convoluted example where this wouldn't be the case. But generally this is the case, which is why increases in aggregate demand, like 1933-1937, cause rapid increases in labor input. What is the relevance of non-aggregate demand based theories of the Great Depression? Basically zero from what I can tell. Outside of monetarism and Keynesianism, it's a desolate intellectual wasteland. ""Doesn't this just pin point a key criticism of the RBC model. If there are frictions in hiring and firing workers, then increases in aggregate demand will show up as increases in productivity. " Don't you people understand basic economics?" I'm not sure if you are being funny or you don't understand what adjustment costs are. With costs to hiring and firing workers, during a downturn the firm will keep more workers than otherwise. They will look unproductive. If AD is stimulated, workers that weren't doing that much have more to do and look more productive. Really though, there ability to turn inputs into outputs wasn't changing. It's just being mismeasured. "This makes no sense to me: aggregate demand simply means there is increased demand for the goods that firms produce. To meet this extra demand, firms can hire more workers, purchase more capital, work their available capital more, or invest in new productive technologies which increase their output per unit of input. Which one firms actually do will depend on the relative costs and benefits of each. So this idea that a change in "aggregate demand" would necessarily require a change in labor input makes no sense to me." Good point, but it's murkier now. 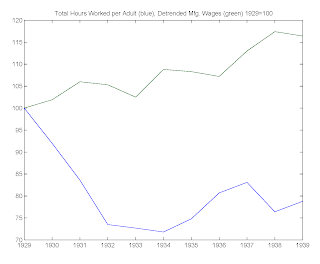 You could wonder was the increase in productivity independent of the increase in demand? Was it just a lucky advance in technology just at that time? Or did the increased deamand spur investment in new technology and utilization of it to meet the new demand? In any case, even Stephen admitted that the giant increase in government spending from WW2 plummeted unemployment from extremely high to almost nothing. He just thinks that plummeting unemployment like that is only worthwhile if the government spending can be justified on its own terms, as a high return public investment, or for good social insurance, say. "With costs to hiring and firing workers, during a downturn the firm will keep more workers than otherwise. They will look unproductive. If AD is stimulated, workers that weren't doing that much have more to do and look more productive. Really though, there ability to turn inputs into outputs wasn't changing. It's just being mismeasured." "Really though, there ability to turn inputs into outputs wasn't changing. It's just being mismeasured." Let me restate that for you: there is no evidence for the previous statements that were made. Ironically, Cole and Ohanian's results (and arguments), far from castigating the NIRA and its wage provisions, confirm/validate their wisdom. To see why, we have to stop seeing the NIRA and NRA as some sort of Frankensteinian experiment, with no fore or after thought! Cole and Ohanian attribute output growth to productivity, not labor growth. But this only confirms the basic underlying premise of the NIRA, namely massive productivity growth throughout the 1920s and 1930s that wasn't reflected in wages. FDR, Robert F. Wagner and the rest of the Brains Trust (especially Rexford Tugwell) were all of the view that wages had lagged behind productivity (owing to the spread of electrification and mass production). That productivity continued to rise in the aftermath of the NIRA simply corroborates their starting point. 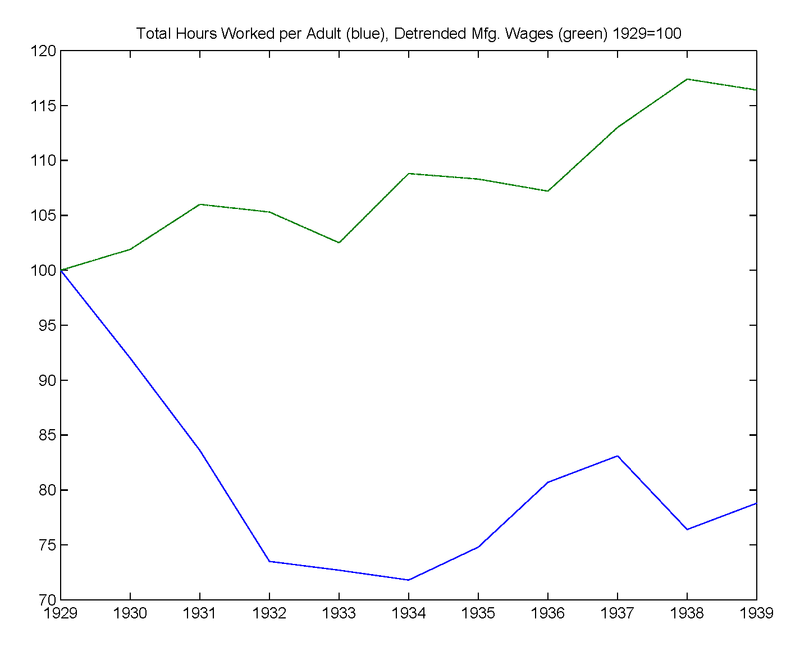 Cole and Ohanian forget that Henry Ford (who campaigned for higher wages throughout the 1920s and 1930s) doubled wages in 1914. Did labor go down? No!!! But productivity continued to rise! !